Podcast NLFM Episode 20: It's Alive! Had you going there for a while, didn't we? Weekly. Ha! Sorry for the absence, fearless listeners, but Nintendo Life's chip and game music podcast NLFM is back on track after a too-long hiatus. And boy do we have some doozies for your ears! 1. Shiryu — The Goddamn Batman (Shiryu’s Arcade vol. 4)2. Yoko Shimomura, Manami Kiyota, Yasunori Mitsuda —.. So 3DS is out in places other than Japan now, hooray! But just because its successor is stealing the spotlight, that doesn't mean the DS is content with resting on its two-dimensional laurels. Why, it's not even April yet and it's already seen at least five fantastic games this year with some fantastic music to go along with them. In this episode, we celebrate those.. Remember when we said NLFM was going to be weekly? Well, we kind of fudged that for the past couple of weeks. Sorry! But we're back with a fiery fever in this episode, where gangsters are punched, pianos diddled and dinosaurs remembered. 1. MONSTER! MONSTER! — Penny Arcade2. Yuzo Koshiro — Go Straight (Streets of Rage 2, Genesis/Mega Drive) 3. Naoki Kodaka — Aflorious..
Ho ho ho! Happy Valentine's Day, citizens of Earth! Let Nintendo Life be your love muffin this year with a very special NLFM dedicated to all things lovey-dovey-goo-goo. If the music of this episode doesn't melt your ice-cold heart even a little then we'll only be hurt just a tad. 1. Shōgo Sakai — Theme of Love (Mother 3, GBA)2. Sam Hart —..
Didn’t we have some fun though? Remember when the podcast was sliding into the fire pit and I said "Goodbye" and you were like "NO WAY!" and then I was all "We pretended we were going to murder you"? That was great. 1. 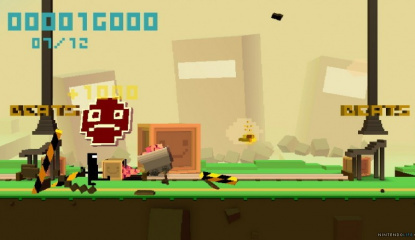 Sick YG — Ain't That Funny (MadWorld, Wii)2. Miyoko Kobayashi and Masanori Hikichi — Underworld.. Gather round, children! Zip it, listen! NLFM is back and bringing the big guns, with a killer Bionic Commando remix, lurvely NES medley by way of PiCTOBiTS, and an almighty power with a huge sword chopping woodland critters. What more could you want? What more??? 1. Star Salzman, Harumi Fujita, Junko Tamiya — Advance..
We're absolutely killing 2011 with our new weekly schedule, even if we're a little late in the day from time to time. As in every episode so far. This episode we're inspired by the 3DS line-up and looking towards both the future and past by checking out some excellent remixes of classic tunes from franchises headed to the.. Your eyes doth not deceive you: NLFM is back with another episode a mere week after the last one. And man, did we almost not make it thanks to an impending snowstorm and travel arrangements. But lo and behold, here is a delicious ear scoop for you. We couldn't bail on our weekly promise one week after making it, now could we? 1. Yuka Tsujiyoko — Fire Emblem..
Changes are a-brewin' with NLFM this year as the show enters its second season. First of all, we're shrinking and growing at the same time. Is your mind blown yet? Tell the rest of the goo in your skull to stay calm, as what this means is that while the average episode will shrink in length, we're ditching the whole monthly schedule shenanigans and going weekly. Yes, weekly..
We look to the future here at Nintendo Life. Why, take this episode of NLFM, the little ol' chip and game music podcast we've got going: it's got an exclusive first listen of the soundtrack to Gaijin Games' upcoming BIT.TRIP FLUX and goes simultaneously back and forth in.. Variety is the spice of life, and thanks to the insane variety of this 10th episode of our chip and game music podcast NLFM you'll be feeling that spice for hours after consumption. It's so spicy that we think we've got flavor for every mood, whether you're in the market for bathroom fisticuffs, looking to revisit the..
Boo! It's a regular fright fest in this episode of NLFM as we queue up some of our favorite horror game tracks. BEHOLD! the wonders of mad science gone wrong! GASP! at the children of the night! WONDER! how Chuck D. Head doesn't need more painkillers! RUN! from the Scissorman! Dare you listen? Dare you not? 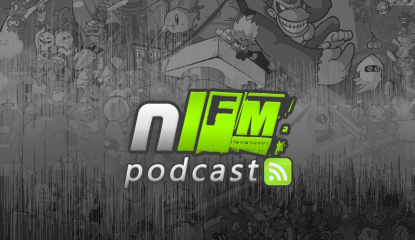 In case you've..
Podcast NLFM Episode 8: Have You Heard Captain Falcon's Theme Song? Some video game themes are so iconic that it's impossible to not recognize where they're from, even if you haven't touched the game in years. Tetris. Super Mario Bros. Captain Falcon? While we're not saying his theme song is up there in the annals of game music legend, after this episode of NLFM, we're pretty confident that you won't look at the..
Listener contributions, confusing homophones and Team Fortress 2 secrets revealed! Oh hi, didn't see you come in there. Stay a while, and listen! Turns out we've got some fine musicians in the audience as we take a look to some listener-created tunes. We've also got a few select choices from The Megas, The World Ends With You, and the song that Akira Yamaoka would like blaring as he leaves this.. It's been a while, space cats, but NLFM is back with another mighty handsome selection of the finest chip and game music around. This time we're splitting chip tunes and swirling epics right down the middle, with equal parts fantastic on both sides. NLFM generally focuses on music from games playable on Nintendo consoles and handhelds, which, thanks to the.. There's a Norwegian, Dark Void Zero, de Blob, Mega rap and the aural debut of Sega's 16-bit beast — what more could you possibly want? Welcome to another jolly good episode of NLFM, the chip and game music podcast from Nintendo Life. We're joined in this double-length episode by special guest Alex Neuse of Gaijin Games, who has schlepped along a crate of his favorite chip/game music tunes and also spills a few beans on the next entry..
Podcast NLFM Episode 1 - Open For Business! We kick off our first game/chip music podcast with YMCK, Anamanaguchi, Metroid Metal and more!